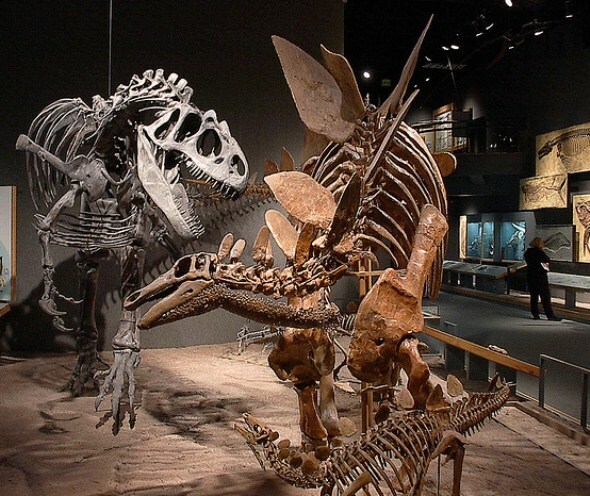 The Denver Museum of Nature & Science, located on the east end of City Park, encourages visitors to explore science and the natural world through its exhibits, planetarium, IMAX theater, programs and lectures. The museum is particularly popular with kids. More than 300,000 schoolchildren visit each year as part of school groups, while the museum counts a total of more than 1.4 million visitors in person or online each year. The museum houses more than 1 million objects in its areas of expertise, which are anthropology, earth sciences, health sciences, space sciences and zoology. The permanent exhibits cover space, Egyptian mummies, gems and minerals, Native American cultures, wildlife, health and prehistoric Earth, plus the hands-on Discovery Zone for kids. The museum also features temporary exhibits. Adults should check out the view from the Leprino Family Atrium, particularly the fourth floor, and from the Anschutz Family Sky Terrace above it, weather permitting. Look west for a view that starts with City Park’s Ferril Lake, boathouse, grass and trees in the foreground, downtown skyscrapers beyond that and snow-clad Rockies in the distance. The museum also has taken charge of the Snowmastodon Project in Snowmass, where a bulldozer operator working on a reservoir expansion unearthed the remains of a female Columbian mammoth. The museum’s team found the remains of 10 American mastodons, four Columbian mammoths, a Jefferson’s ground slot, four Ice Age bison, two Ice Age deer and a variety of other pieces from an ecosystem buried for more than 45,000 years. A life-size Snowmastodon sculpture honoring the project was dedicated in October 2014 outside the northwest corner of the Museum. The landscaping around it reflects the mastodon’s natural surroundings. The new Morgridge Family Exploration Center includes high-tech learning facilities for children, such as The Discovery Zone, where experiences such as Dinosaur Gulch, the Big Backyard, and Explorers Playhouse help build a strong foundation of science skills for young children through hands-on, highly experiential Museum experiences. The 120,000-square-foot addition also includes Exploration Studios and the Anschutz Gallery. Exhibits, activities, and programs focus on the science process skills, such as observing, quantifying, inquiring, analyzing, creating, and communicating. The gallery provides experiences that expose early learners to basic science concepts in physical science, life science, earth and space sciences, math, and human culture, engaging them in open-ended play and experimentation. The museum was founded in 1900 as the Colorado Museum of Natural History to house the collection of flora and fauna assembled by pioneer and naturalist Edwin Carter of Breckenridge, and moved into the current building in 1908. Its first acquisitions included crystalline gold specimens from John F. Campion and butterflies and moths from John T. Mason, and its collections have continued to grow for more than a century. The building that debuted in 1908 has been expanded by the addition of the Phipps Auditorium in 1940, Gates Planetarium in 1968, an IMAX theater in 1983, a 187,000-square-foot addition in 1987, and the Leprino Family Atrium and Anschutz Family Sky Terrace in 2002 and the Morgridge Family Exploration Center in 2014. Today, the building has more than 600,000 square feet.